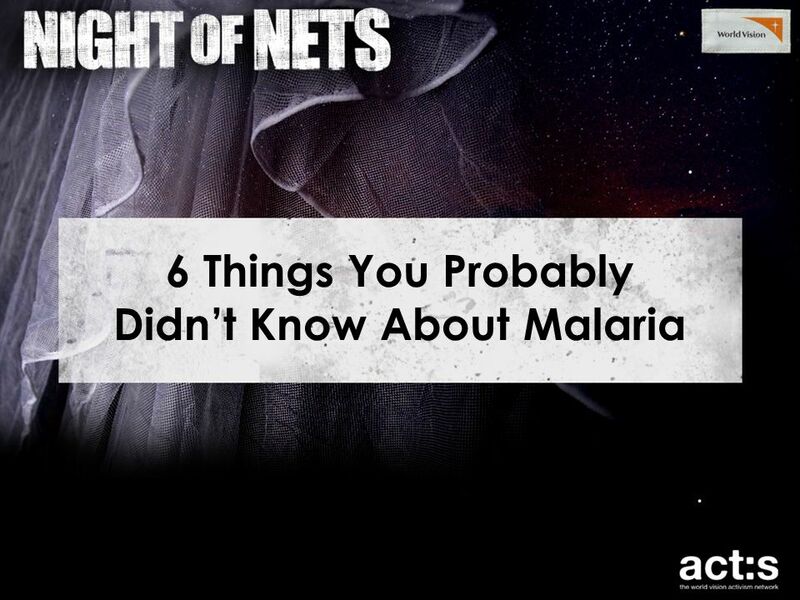 6 Things You Probably Didn’t Know About Malaria. 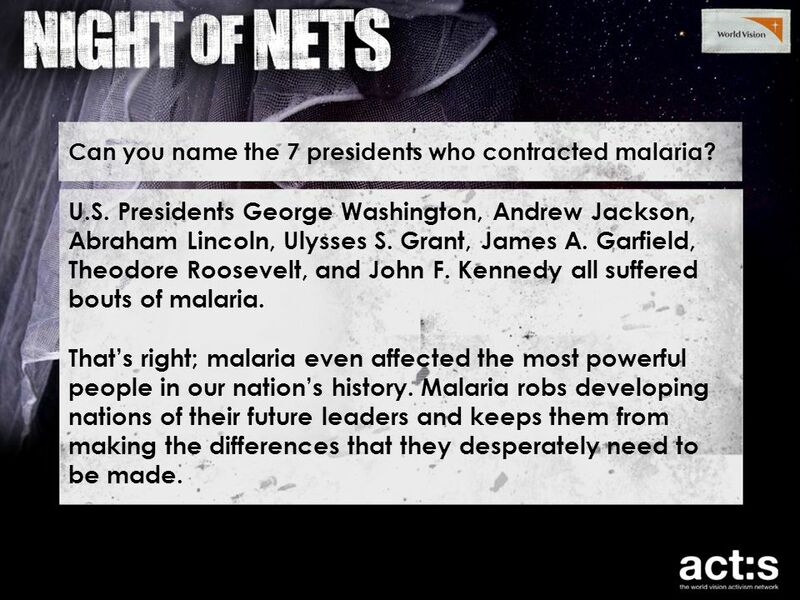 Can you name the 7 presidents who contracted malaria? 2 Can you name the 7 presidents who contracted malaria? 3 U.S. Presidents George Washington, Andrew Jackson, Abraham Lincoln, Ulysses S. Grant, James A. Garfield, Theodore Roosevelt, and John F. Kennedy all suffered bouts of malaria. That’s right; malaria even affected the most powerful people in our nation’s history. Malaria robs developing nations of their future leaders and keeps them from making the differences that they desperately need to be made. 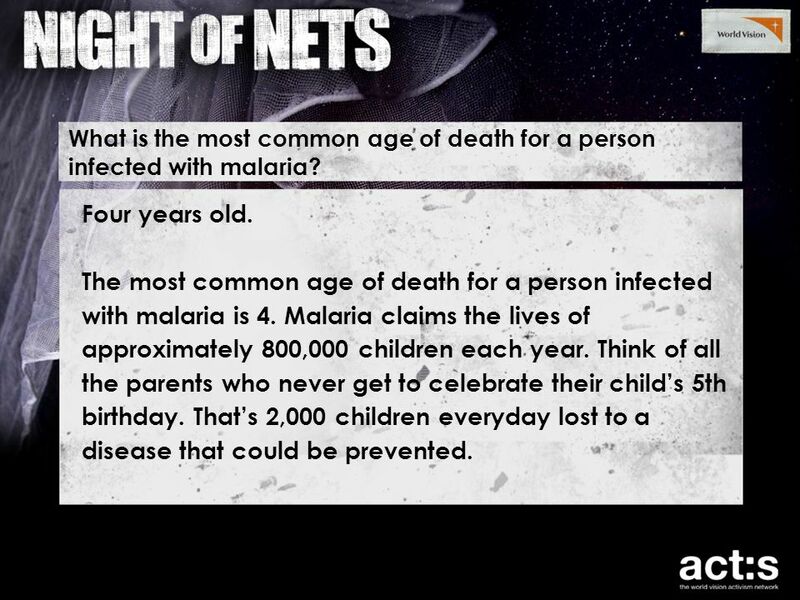 4 What is the most common age of death for a person infected with malaria? 5 Four years old. The most common age of death for a person infected with malaria is 4. Malaria claims the lives of approximately 800,000 children each year. Think of all the parents who never get to celebrate their child’s 5th birthday. That’s 2,000 children everyday lost to a disease that could be prevented. 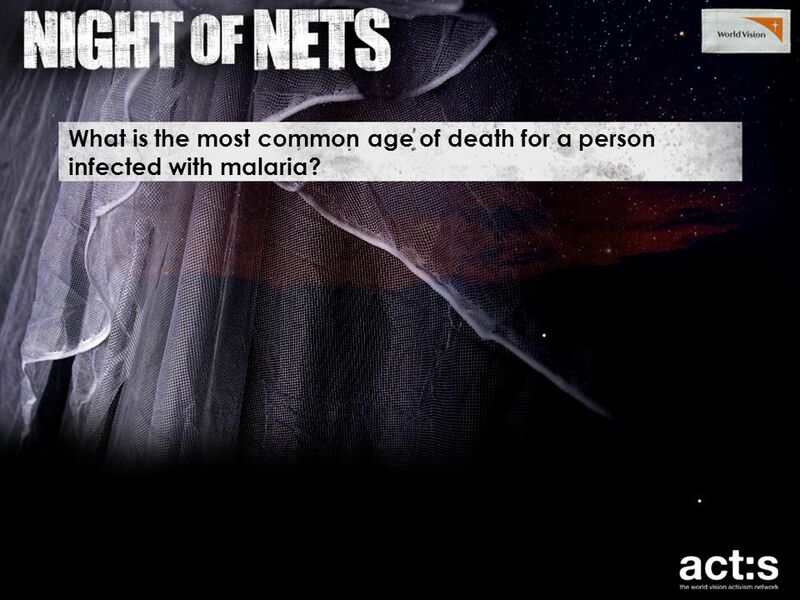 What is the most common age of death for a person infected with malaria? 6 How much money does malaria cost a low income African family? 7 The average amount spent each year by a low-income African family for malaria treatment is $19 -- out of a yearly income of $68. That’s almost a third of their incomes. The WHO reports that in some areas malaria may account for as much as 40% of public health expenditures. In addition to the death toll, malaria costs African around $12 million annually in lost economic productivity. Imagine how great this economic impact is for people living on less than $2 a day. 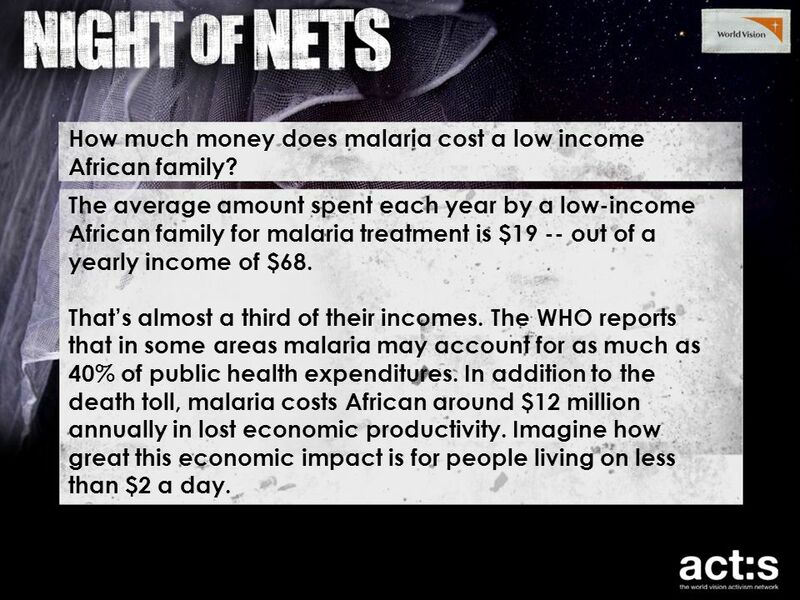 How much money does malaria cost a low income African family? 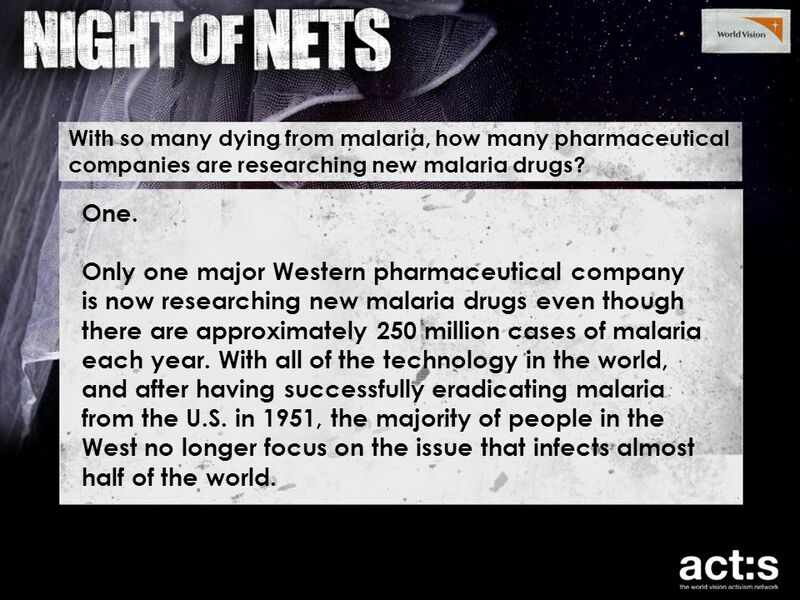 8 With so many dying from malaria, how many pharmaceutical companies are researching new malaria drugs? 9 One. Only one major Western pharmaceutical company is now researching new malaria drugs even though there are approximately 250 million cases of malaria each year. With all of the technology in the world, and after having successfully eradicating malaria from the U.S. in 1951, the majority of people in the West no longer focus on the issue that infects almost half of the world. With so many dying from malaria, how many pharmaceutical companies are researching new malaria drugs? 10 How many lives can adequate bed nets save a year? 11 One million children. The use of bed-nets has the potential to prevent as many as one million deaths per year from all causes for children under 5 in sub-Saharan Africa alone. Yes, successful prevention of malaria with the use of bed nets can not only save people from malaria, but also other deaths that occur as a result of weakened immune systems following bouts with malaria. For just $6, you can save the life of a child. How many lives can adequate bed nets save a year? 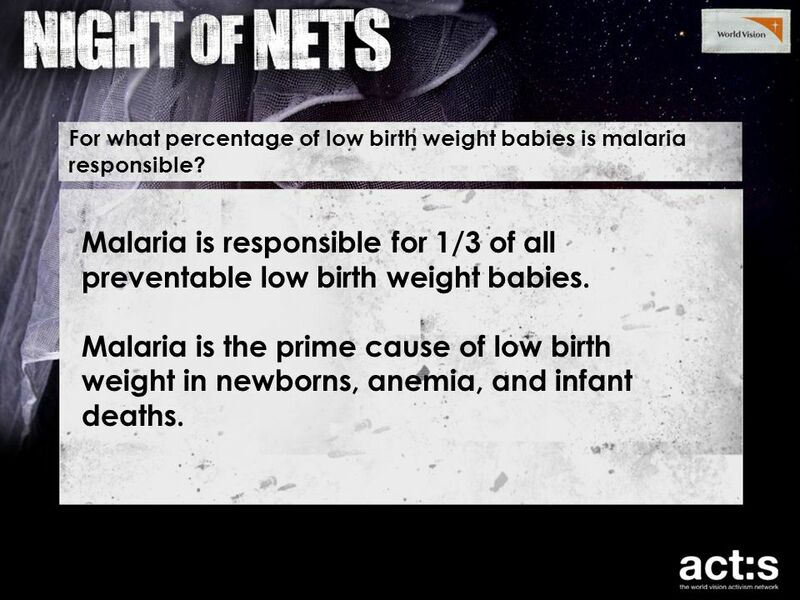 12 For what percentage of low birth weight babies is malaria responsible? 13 Malaria is responsible for 1/3 of all preventable low birth weight babies. Malaria is the prime cause of low birth weight in newborns, anemia, and infant deaths. For what percentage of low birth weight babies is malaria responsible? 14 No child should die from a mosquito bite. 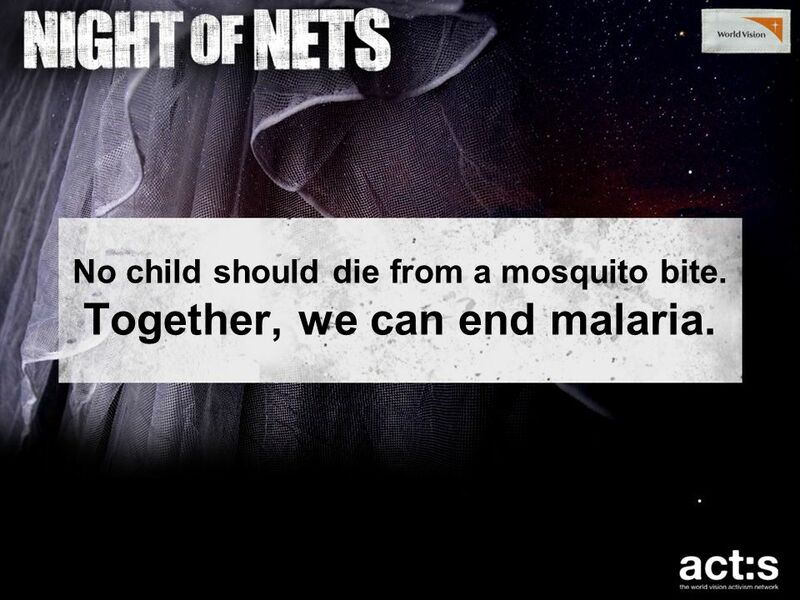 Together, we can end malaria. Download ppt "6 Things You Probably Didn’t Know About Malaria. Can you name the 7 presidents who contracted malaria?" EPIDIOMOLGY OF HIV IN NIGERIA by Dr Ibrahim M Kida. TUBERCULOSIS Tuberculosis (TB) is a contagious disease. If left untreated, it can be fatal. The largest number of TB cases in 2005 were in South-East Asia. Population Patterns in Africa. Natural Increase  Birth Rate - Death Rate = Natural Increase  Africa’s birth rates remain high, while death rates have. Wealth and Power George Washington, the nation's first president, was a wealthy man. Mount Vernon, his Virginia plantation, was spread across 8,000 acres. Millennium Development Goals. MDGs The Millennium Declaration, adopted by 189 heads of state at the United Nations Millennium Summit in 2000, committed. MALARIA History The disease How people get Malaria ( transmission) Symptoms and Diagnosis Treatment Preventive measures Where malaria occurs in the world. Malaria: A brief introduction provided by Dr Lynn Fischer, a family doctor in Ottawa. Geographic Factors and Impacts: Malaria IB Geography II. MALARIA KILLS. Send a net. Save a life.. Mosquito Tag. ARIAtlas.org. Pneumonia is responsible for nearly 20 percent of child deaths globally. Source: ARIAtlas.org, World Lung Foundation 2010. Living Standards. How do we measure the standard of living in a country?  We can look at a number of key measurements:  Average income  Quality of. Presented to you by: Moin Patel. What type of illness is it? Malaria is a mosquito- borne infectious disease of humans and other animals.